RAGETRADES! 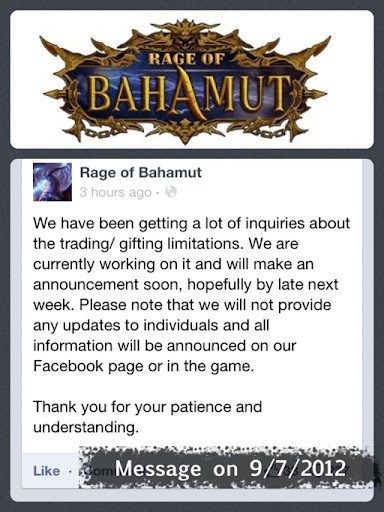 YOUR SOURCE FOR RAGE of BAHAMUT INFO, HELP and TRADES: Need another gacha style ard game? Need another gacha style ard game? I'm guessing trades won't be up for a while now. 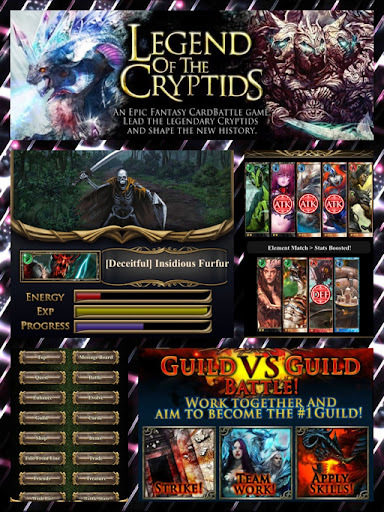 If you need a new game check out Legend of the Cryptids. So of you're going to start playing on are on iPhone, get yourself and me the same invite prize (it's similar to Mina but not 19 cards). Also android is on separate server, so if someone here plays on android. Please post ur code only for Loc. So it turns out that LoC Guilds don't care how awesome u r at ROB. Lmao. 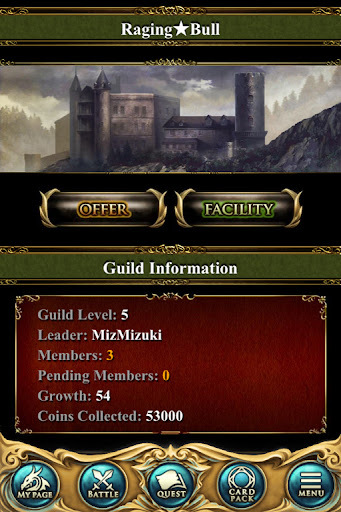 Anyway started a guild (same thing as an order exactly even down to the wall prices). BTW it's only for iOS Users (Android is on a different server). So send me what they call a "cheer" (support) to MizMizuki (case sensitive). Let me know that u want to join and that you are from ROB (if u want to state your ROB IGN/LvL. that works). Don't know how serious we'll get here but I'm guessing this isn't the first time ROB is going to outlaw trades. So at least we'll have somewhere else to go. PS if you can donate unused treasure that would be a big help. Click here to see an ROB/LOC comparison. Please use event21 as your referral code. For the Legend of the Cryptids. Well legend of the cryptids make it harder to hack into because of the debugging files that load with your application. It still can be done but not as easily as it is with ROB for the novice who just learned how to jailbreak. I'm playing same as RoB (johncfl71). I'm not that into the game, but it fills the gap (somewhat). The game always seems to crash during a battle with Payne. UGH! Oh well. At least we can trade, although, I don't really want to get too invested in this game. I'm just still learning more about RoB. I don't think they have a big issue with multiple accounts since it's registered to a valid device. There's much more to fix than feeder accounts. Example: RubberChip Check this guy out. He's level 52 and has 752 Defense Power. How did he get all that? Is it even possible? At his current level? These kinds as well as the "Phantom Legend" cards that were confiscated are the true problems with this game. But, I ramble...see you either on RoB or LoC. Started playing legends of the cryptids while waiting on RoB to bring back trades. My referral code is claxton13 for Android users. Apparently Cygames and Applibot are owned by the same parent company. So does that mean Legend of the Cryptids and Rage are basically the same? No one here has mentioned this. Funny how they're both doing a login stamp bonus campaign. My referral code for Loc is Event21.Please use so both can get a bonus. Thank you MizMizuki for mentioning cryptids on here. It is occupying many RoB players time while we wait on trading to come back. So, what do you think of the new trading system??????? Ugh. Idk. Not my cup of tea. I'll try it out but might switch games if it's as much as a pain in the a** as I think it's going to be. By the way. Click the classifieds menu option then go to ROB news if u guys need more info. This game looks promising, especially with the revamps to RoB & the Bazaar. Use Turnip for referral code on Android LoC.